The parent exponential function f(x) = bx always has a horizontal asymptote at y = 0, except when b = 1. You can’t raise a positive number to any power and get 0 or a negative number. You can’t multiply before you deal with the exponent. When you have multiple factors inside parentheses raised to a power, you raise every single term to that power. For instance, (4x3y5)2 isn’t 4x3y10; it’s 16x6y10. 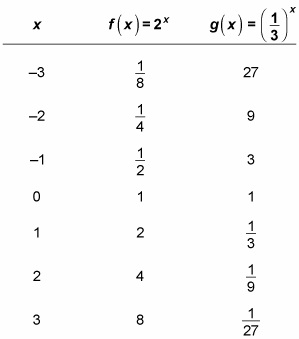 The table shows the x and y values of these exponential functions. These parent functions illustrate that, as long as the exponent is positive, the graph of an exponential function whose base is greater than 1 increases as x increases — an example of exponential growth — whereas the graph of an exponential function whose base is between 0 and 1 decreases towards the x-axis as x increases — an example of exponential decay. The graph of an exponential function who base numbers is fractions between 0 and 1 always rise to the left and approach 0 to the right. This rule holds true until you start to transform the parent graphs.